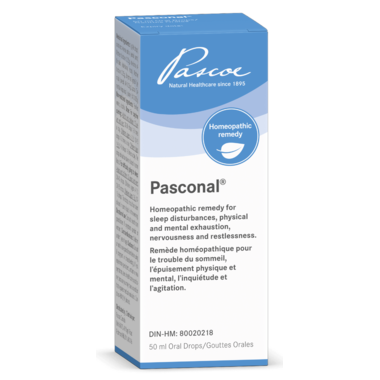 Pascoe Pasconal is a homeopathic remedy for sleep disturbances, physical and mental exhaustion, nervousness and restlessness. Directions: Dosing for daytime calming: Adults and children ≥ 12 years: 20-30 drops, 1-3 times a day; Children (ages 6-11): 10-15 drops 1-3 times a day; Children (ages 1-5 ): 5-10 drops 1-3 times a day; Dosing for difficulty going to sleep: (To be taken in the evening) Adults and children ≥12 years: 30-40 drops; Children (ages 6-11): 20-25 drops; Children (ages 1-5): 10-15 drops. The drops should be diluted in some liquid. Caution: Contraindicated in children under 1 year of age. Consult a health care practitioner before using if pregnant or breastfeeding. If you experience persistent, unclear or new symptoms, see a health care practitioner because you may have a condition that requires medical evaluation. This was recommended to me from my Naturopath for anxiety and sleep disruptions. Since using it months ago I have had much better sleeps and anxiety has been more manageable.